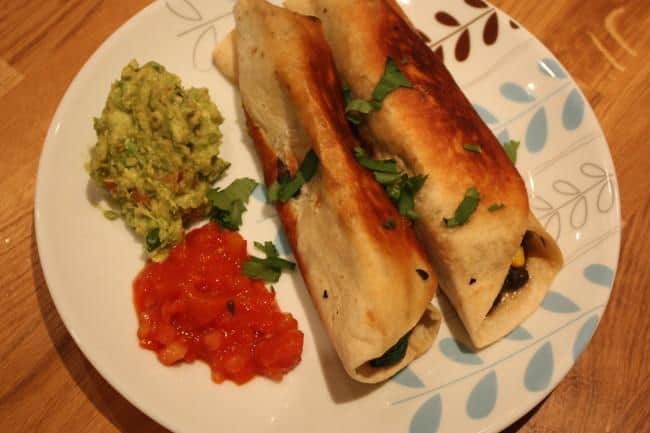 I spotted a recipe for black bean flautas (vegetarian rather than vegan, due to the cheese) over on Oh My Veggies the other day, and I couldn’t stop thinking about it. I immediately put it on my ‘to make’ list. Dishes often languish on that list for months, but the flautas lasted all of five days before I made them. These were very popular with my non-vegan boyfriend, who loves Mexican food. As usual, I made some adaptations. I lined the tortillas with vegan cheese, so it would melt into the flautas, rather than sprinkling on top. I also had both salsa and guacamole as dipping sauce. And since I had half a leftover courgette in the fridge, I decided to fry some up with corn, in a Mexican spice mix, to add some more flavours to the flautas. Since you can’t easily obtain refried black beans in supermarkets in the UK, I decided to make my own. I made it in the slow cooker (crock pot). If you have one, I highly recommend this method – you can make it on low heat while you’re at work, on in 4 hours on high heat. 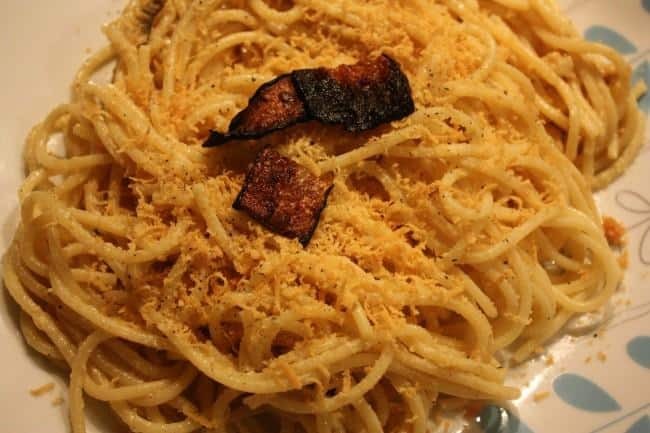 It’s low effort, high flavour, and makes the house smell amazing! While the beans are low effort, the flautas are not, what with all the frying and holding them together with toothpicks – but they are well worth the effort, trust me! Preheat oven to lowest setting, to keep flautas warm (optional). Heat 1 tbsp vegetable oil over high heat in a frying pan or wok. Add chopped courgette and spice mix, and stir fry until soft. Add frozen corn and fry until the corn is cooked through and the courgette begins to brown. Remove from heat. 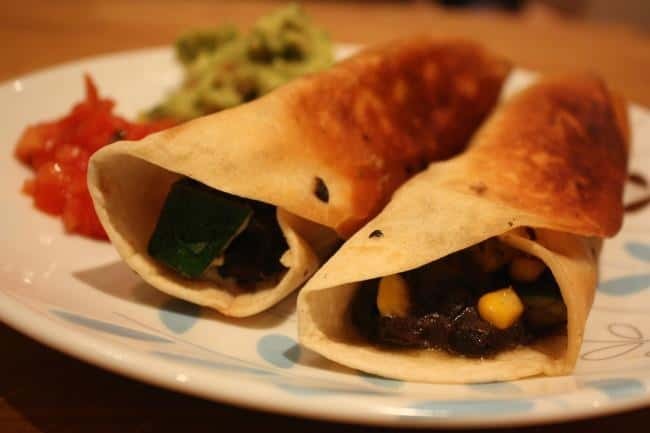 Construct flautas by spreading cheese on a tortilla, topping with refried black beans and courgette/corn mix. Roll up and seal shut with 3 or 4 toothpicks. Heat oil over high heat in a frying pan or wok. Add as many flautas as you can fit and fry on each side until browned. If you want to keep them warm, place on a tray in the oven while you fry the other flautas in batches. 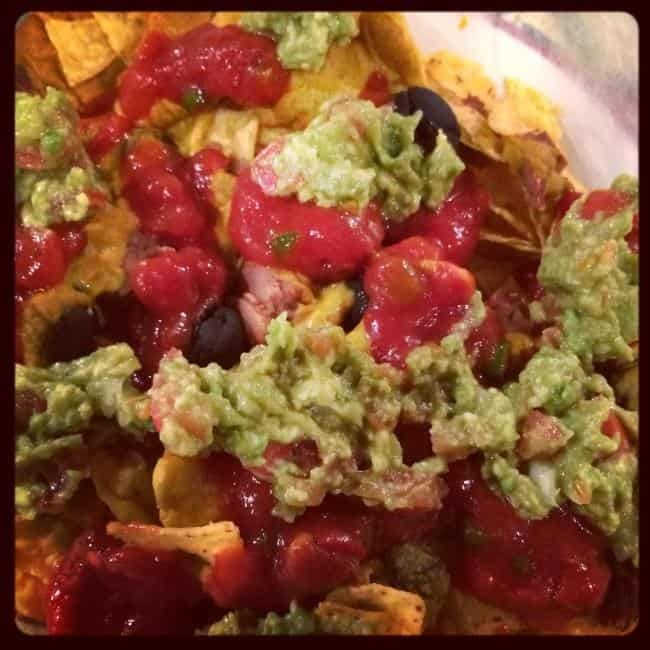 Serve with salsa, guacamole, and vegan sour cream to dip. Add all ingredients to slow cooker. If cooking while you’re at work, leave on low heat. Otherwise, you can cook in 4 hours on high heat. Remove 1 cup of liquid and reserve to the side to use as needed. 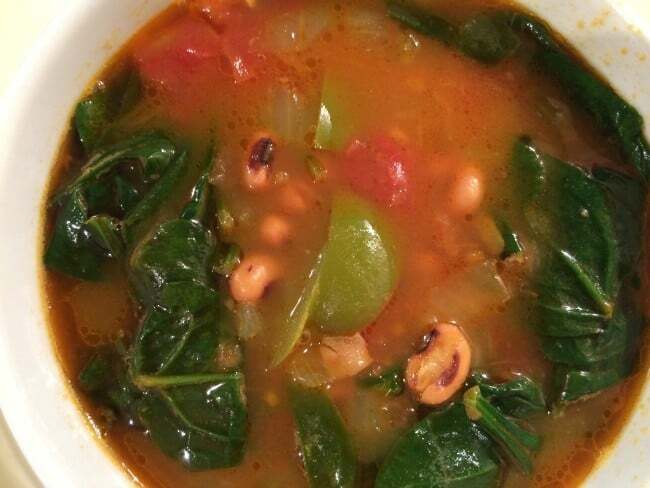 Drain water from beans and return to slow cooker or place in a mixing bowl. Mash with a potato masher. Add more water from the reserved bean water if needed to aid mashing, or add a bit of olive oil. I’ve never heard of flautas and before, but pretty sure they’d go over a storm down here – Mexican food can never be wrong anywhere near me. 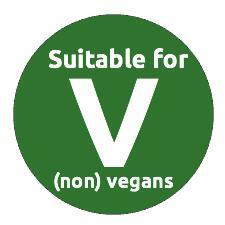 Which vegan cheese do you use? I’ve yet to find one that’s convinced me, but I live in eternal hope of discovering one! It was just Cheezly. I’m not really a big fan of vegan cheeses tbh, haven’t found one that suits either – I usually make my own from cashews but was feeling lazy, and I’ve found recently that I don’t mind a little bit of Cheezly on pizza if there are loads of other flavourful toppings, and I thought the same would be true with the flautas (it was!). I’ve recently heard loads of good things about Jeezini but I haven’t got my hands on it to try yet – have you had it? It has been years and years since I’ve had flautas. They used to be a big favorite of mine. I’ll have to keep these in mind the next time I need something fried! I can’t believe I lived so long without trying them – so so good! I am experimenting with different ice cream bases at the moment. I tried making this one with soya milk and soya cream base, but it didn’t turn out very well, which is why I’ve gone back to the trusty coconut milk base. But feel free to use a different base (just note that alcohol changes the freezing properties meaning it won’t freeze as hard as ice cream without alcohol). By the way, if you find coconut milk to be prohibitively costly, try a Chinese or Indian supermarket – I got two 400ml tins for £1!